While this fancy dish may seem intimidating, the cooking process is a lot easier than it seems.This recipe was first published in Flavours magazine. Roast the celeriac whole at 180˚C till very soft, about 2 hours. Cut celeriac in half and scoop flesh out with a spoon. Place in blender and process till smooth, then mix with cream and red palm oil, and season to taste. Season scallops with salt. Heat a little palm oil in a non-stick pan and sear the scallops for 1 to 2 minutes on each side; the outside should be slightly browned, but the inside should still be translucent. 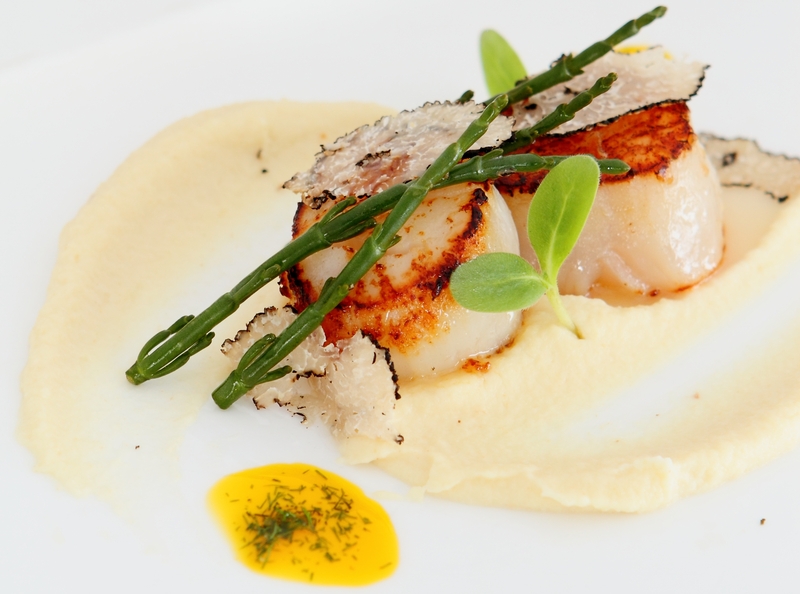 Place a spoonful of celeriac puree in the middle of the plate, top with scallops and sea asparagus, and drizzle with dill-infused oil. Garnish with truffles and shiso leaves.